If you miss it in June you won't have another opportunity until the year 2117. The 2012 transit of Venus across the face of the sun will be the last time the event will ever be visible to people alive today. The next time the celestial sight will occur is in 2117. 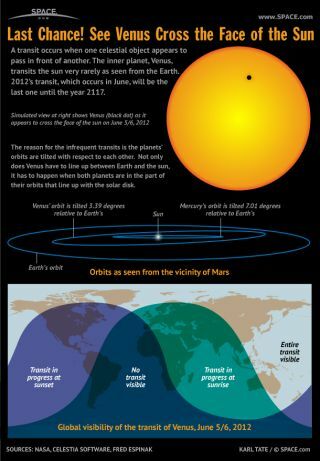 Learn more about the rare Venus transit, which last occurred in 2004, here in the SPACE.com infographic above. While this rare transit of Venus will take place on June 5 for Western Hemisphere observers, it will be June 6 local time for skywatchers in the Eastern Hemisphere. It will last about 6.5 hours as Venus crosses the solar disk from our perspective, appearing in silhouette as a slow-moving tiny black dot, weather permitting. Venus transits come in pairs that are eight years apart, but these dual events take place less than once per century. The last one occured in 2004, and the next won't come until 2117.